I like these old Action Packed cards. Check out Frankie Crosetti stuffing his fielding glove in the back pocket of his baseball pants. These days the pants are smaller and the gloves are bigger - probably easier to put the pants in the glove now. Alan Trampoline, ha ha. There were 26 cards in this package, and 4 of them were Alan Trammell. Not surprising coming from a Tigers fan. But in the package I got last week from Baseball Every Night, 5 of the 28 cards were Trammells. And he's not even a Tigers fan. A nice high-end card of one of my favorite Yankees. This is my favorite card in the package. I had never seen these Triad cards before - they were produced for Whataburger restaurants in Texas. It's a great looking card - lenticular like a Sportflics, only the Ryan picture doesn't move, the purple and blue background does. The 30-Day Baseball Card Challenge initiated by Tony of Off Hiatus Baseball Cards looks like it will be a lot of fun. Happy to participate. Day 1 is a card from the current year with a photo you like. I am going to try to keep these limited to cards that I have, though this will not be possible with every topic. For this first one, I only have three cards yet from 2017, as I almost never buy retail so I get the new year's cards slowly through trades. Nice to see Topps paying more attention to the photography this year. 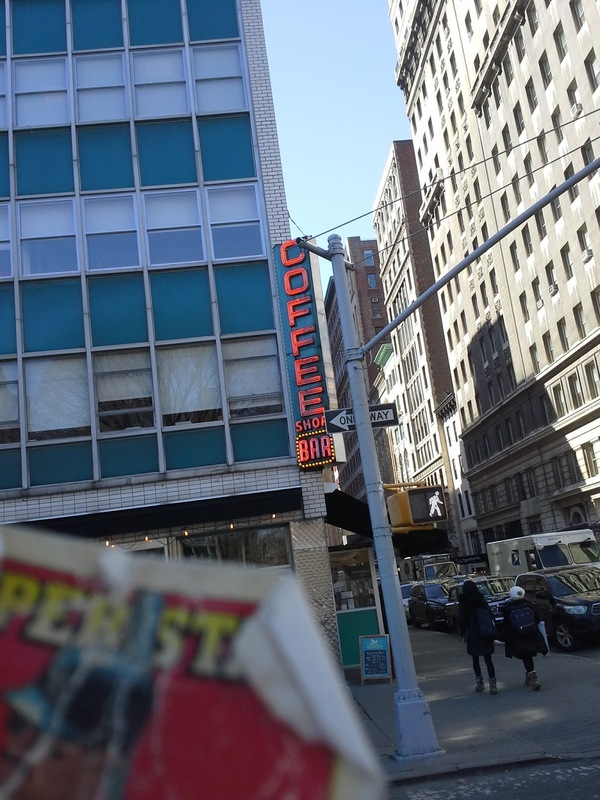 On Union Square West is a high-price restaurant best known for catering to models known ironically as The Coffee Shop. The restaurant gets its name from the great vintage neon sign which has survived several different business at this location. Even cooler, they have kept the name on the lobby floor from when it was the Jack Chase Coffee Shop in 1959. I have one card of Rod Billingsley, from the 1989 Spokane Indians set. Playing career: Catcher Rod Billingsley played in the Padres organization in 1989 and 1990. In 57 games he hit .209 with 2 HR and 24 RBI. A fuller account of his career can be found at The Greatest 21 Days. Where he is now: Head of US Federal Government Sales at Tintri, an IT contractor. Google Autocomplete results: He is fourth when you type Rod Billi, between Rod Billington and Rod Billington Frodsham, both of which refer to a mortgage broker in the UK. Another prominent Rod Billingsley managed a convenience store in Missouri. Coming up next: The next profile will be Ty Blach. - Can anybody use these codes? - Still sorting through all those boxes. Mixed in with the baseball were about 50-75 soccer cards - Topps and Donruss from 2015 and 2016. Also around the same number of golf cards from 2013 SP. Anybody collect either of those sports? - My wallet card has really been taking a beating. Most worrisome is that a rip was almost completely bisecting the middle of the card, threatening to tear it in two. I saw nothing in the original wallet card post on Baseball Card Breakdown about not being able to alter the card, so I taped up the middle. It's much sturdier now. I photographed it in the pocket of a book I picked up from my local library which they have had since the early 1970s. The Oceanside Free Library is now just called the Oceanside Library. The phone number is still the same but no longer has the RO exchange, which refers to the nearby town of Rockville Centre. 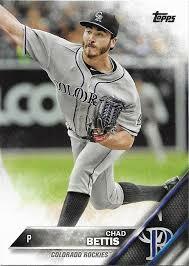 I have one card of Jeff Bianchi, from 2013 Topps Update. Playing career: Infielder Jeff Bianchi played for the Brewers from 2012 to 2014 and the Red Sox in 2015. In 165 games he hit .215 with 4 HR and 40 RBI. Where he is now: Spent 2016 in the Rockies organization, hitting .245 with 2 HR and 19 RBI at AAA Albuquerque. He does not appear to be with a team in 2017. Google Autocomplete results: He is ninth when you type Jeff Bi, between Jeff Big Brother 17, a reality show contestant, and Jeff Binder Actor, a film and stage performer. Another prominent Jeff Bianchi is conductor of the American Youth Symphonic Orchestra. Coming up next: The next profile will be Rod Billingsley. - There is a card that came from a 2016 Topps pack with a code to access an MLB The Show 16 standard item pack. This expires March 31, 2017. I'll send the code to the first person who comments here that they can use it. - Also a code from 2015 Topps Bunt for at least 1000 free coins. There is no expiration date so I have no idea if this code is still valid. Again, first person who comments that they can use it get it. 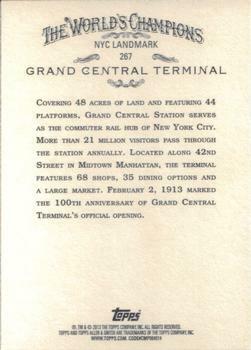 The 100th anniversary of Grand Central Terminal was in 2013, not 1913. (In 1813 there was no regular rail service in the US, and New York City had not expanded nearly as far north as the current location of GCT). Recently an entire block of buildings next to Grand Central was demolished, to be replaced by a 100-story superskycraper. 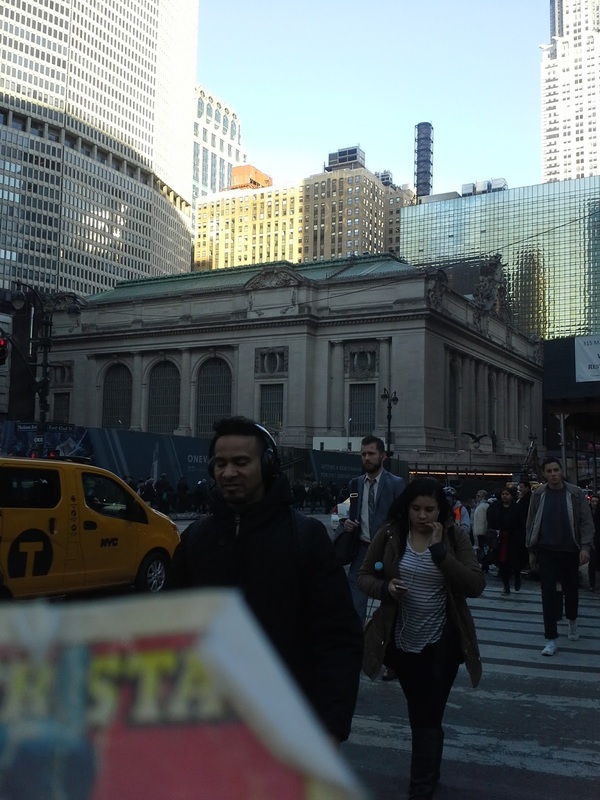 This temporary lack of neighbors has allowed New Yorkers a temporary wide view of the station, where you can fully see the front and side together. One the new building is up, this view will be gone again. I have one card of Chad Bettis, from 2016 Topps. Playing career: Chad Bettis pitched in the Rockies’ bullpen in 2013 and 2014, and made the starting rotation in 2015, going 8-6 with a 4.23 ERA. He had his best season yet in 2016, going 14-8 with a 4.79 ERA in 32 starts. Where he is now: Unfortunately Bettis is currently undergoing chemotherapy for testicular cancer. He hopes to return to the Rockies by mid-summer. My memory: Only know him from his card. Google Autocomplete results: He is ninth when you type Chad B, between Chad Bachelorette Twitter, referring to a reality show contestant, and Chad Brown Trainer, referring to a horse trainer. Another prominent Chad Bettis is an attorney in South Carolina. Coming up next: The next profile will be Jeff Bianchi. JediJeff of 2 by 3 Heroes is another one of the very generous bloggers out there. I got some of the cards from his annual Tis The Season giveway yesterday. Most of the package was 2015 Gypsy Queen. That year had a nice design. There were also several inserts from the set, including one highlighting the most recent Yankees playoff success, from five years ago. He threw in some other cards as well, including a bunch of cards with players wearing throwback jerseys. He also knocked off a few more of my 2015 Topps set needs. Peter from Baseball Every Night is one of the most generous bloggers this side of Arkansas. He's been giving away cards from some of his old binders and I found about thirty that I needed, all oddballs from the 1980s and 1990s. Peter is a big Darryl Strawberry collector, so I'm always looking for Strawberrys for him. He had an extra one of these which I was happy to get. Darryl Strawberry and Ruben Sierra were two of the most exciting players on the 1995 Yankees team, which at the time was the best Yankee team since I started following them in 1986. I know Sierra ended up getting a bad rap but no one was more exciting when he was at the plate. Some of the cards he sent were of the unlicensed variety, which I always enjoy. The design here is more ambitious than the usual unlicensed fare. It was produced by Pacific Cards & Comics which as far as I can tell was not related to Pacific Trading Cards. 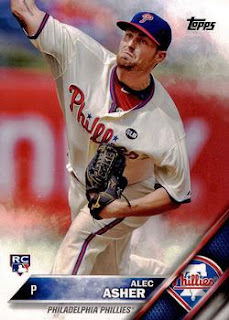 I have one card of Jason Berken, from 2010 Topps When They Were Young. Playing career: Jason Berken pitched for the Orioles and Cubs from 2009 to 2012. In 110 games he went 10-20 with a 5.36 ERA. Interestingly, for a guy who pitched over a hundred major league games, his only big league baseball card features a picture of him in Little League. Where he is now: In the Blue Jays organization in 2016, he pitched in 29 games split between AA and AAA, going 2-9 with a 4.43 ERA. He does not appear to have signed on with a team for 2017. My memory: I remember him vaguely as one of many supposedly good young pitchers the Orioles would trot out in the late 00s. Like Berken, most didn’t last long in the majors. Google Autocomplete results: He is fourth when you type Jason Berk, between Jason Berk DDS, an orthodontist on Long Island, and Jason Berkeley Fosun, a real estate developer. Another prominent Jason Berken is a guitar tech for Bob Dylan. Coming up next: The next profile will be Chad Bettis. Modern office towers are not usually my Wallet Card subject, but when I saw Defgav's custom card of the Morgan Stanley Building on Johnny's Trading Spot, I figured, if it's good enough to be a Defgav custom, it's good enough to be a Wallet Card photo too. 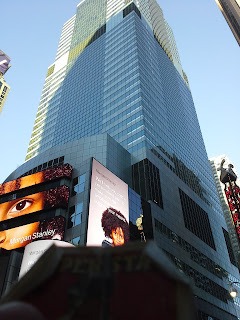 Morgan Stanley has been at this location at 1585 Broadway since 1995 but is considering a move to the newly developed Hudson Yards. 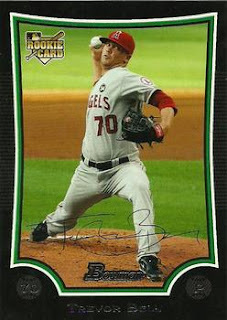 I have one card of Eric Berger, from 2008 Razor. 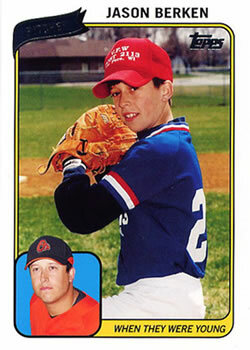 Playing career: Eric Berger pitched six seasons of professional baseball, mostly in the Indians organization. In 194 games he went 28-29 with a 3.95 ERA. Where he is now: He is an entrepreneur whose businesses include a transportation service in Jamaica and a pretzel necklace vendor in the US. Google Autocomplete results: He is fifth when you type Eric Berg, between Erich Bergen, an actor, and Eric Berg Hazlet, a New Jersey man arrested in a prescription drug ring. The first entry when you google Eric Berger is not the ballplayer but the senior space editor at Ars Technica. Coming up next: The next profile will be Jason Berken. I have one card of Trevor Bell, from 2009 Bowman Draft. Playing career: Trevor Bell pitched for the Angels from 2009 to 2011 and the Cubs in 2014. In 54 games he went 4-8 with a 5.57 ERA. Where he is now: Anyone know where Trevor Bell is now? Interesting facts: His grandfather, Bob Bell, was the original Bozo the Clown. Google Autocomplete results: He is fifth when you type Trevor Be, between Trevor Bender, a murder victim from Mastic, NY, and Trevor Bernard Bronx, an elevator operator arrested for groping a girl. Another prominent Trevor Bell is a kick returner for the Columbia football team. Coming up next: The next profile will be Eric Berger. 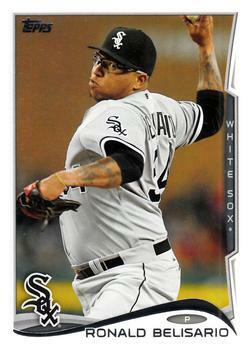 I have one card of Ronald Belisario, from 2014 Topps Update. Playing career: Ronald Belisario pitched for the Dodgers, White Sox and Rays from 2009 to 2015. In 341 games, all in relief, he went 24-20 with 12 saves and a 3.85 ERA. Where he is now: Anyone know where Ronald Belisario is now? Google Autocomplete results: He is seventh when you type Ronald Bel, between Ronald Bel Obituary, referring to a recently passed former Oregon state legislator, and Ronald Bellamy, a former wide receiver for the Dolphins. There do not appear to be any other prominent Ronald Belisarios. Coming up next: The next profile will be Trevor Bell. I have three cards of Pedro Beato. This one is from 2011 Topps. Playing career: Pedro Beato pitched for the Mets, Red Sox and Braves from 2011 to 2014. In 84 games, all in relief, he went 4-2 with a 4.35 ERA. Where he is now: He spent 2016 in the Orioles organization, going 5-5 with 4 saves and a 2.65 ERA for AAA Norfolk. My memories: I remember him vaguely with the Mets but nothing specific. Google Autocomplete results: He is second when you type Pedro Be, between Pedro Bertolini and Pedro Bertolini Age, both of which refer to a model. Another prominent Pedro Beato is a disbarred attorney in Massachusetts. Coming up next: The next profile will be Ronald Belisario. 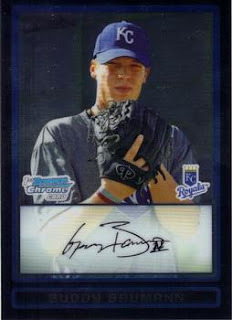 I have one card of Buddy Baumann, from 2009 Bowman Draft Picks & Prospects Chrome. Playing career: After an eight year minor league career, Buddy Baumann made his major league debut for the Padres in 2016, going 1-0 with a 3.72 ERA in 11 games. Where he is now: In spring training with the Padres. Google Autocomplete results: He is seventh when you type Buddy Ba, between Buddy Bar, a door jammer, and Buddy Bands, a fictional headband from the TV show “Saved by the Bell”. There do not appear to be any other prominent Buddy Baumanns. Coming up next: The next profile will be Padro Beato. Everything that exists has a dedicated core of fans. There are baseball card fans. Sign fans. Elevator fans. Escalator fans. And even toilet fans. 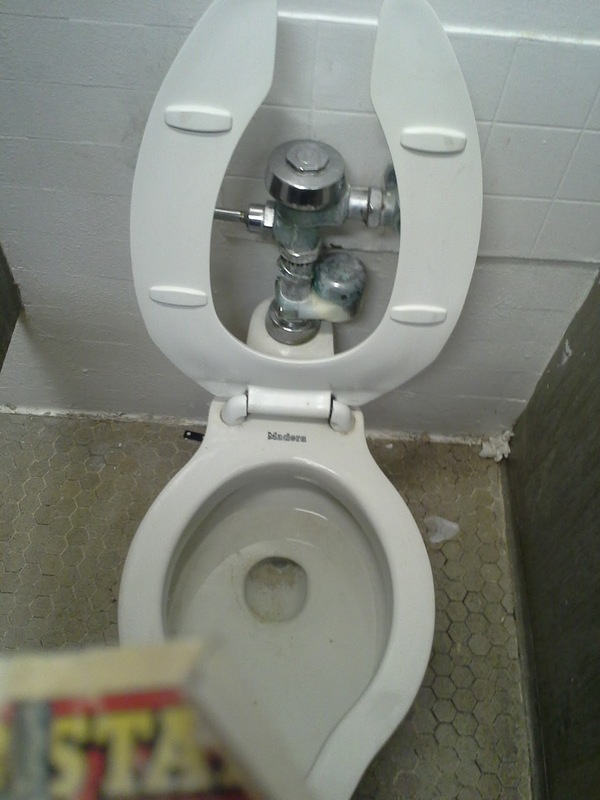 There is a small but dedicated community of people who post videos of all the toilets they find, with comments as extensive and spirited as you would see on any baseball card forum. It's not really my thing, but I respect people who love something enough to become an expert on it. And these people can look at a toilet and instantly rattle off the make, model and year. And yes, after taking the photo I used a 93-year-old toilet. I hope its still around in 2024! I have one card of Jeff Barton, from the 1989 Spokane Indians set. Playing career: Outfielder Jeff Barton played in the Padres organization in 1989 and 1990. In 152 games he hit .251 with 6 HR and 86 RBI. A fuller account of his career can be found at The Greatest 21 Days. Where he is now: Vice President & Regional General Manager at MobilexUSA. My memories: He shared his thoughts on baseball cards with this blog in 2014. Google Autocomplete results: He is fifth when you type Jeff Bart, between Jeff Bartlett Apollo, referring to a portfolio manager at the investment firm, and Jeff Bartenbach, Head of Experience at Wink. Coming up next: The next profile will be Buddy Baumann. The flagship Macy's at Herald Square, built in 1902, is famous for many things. 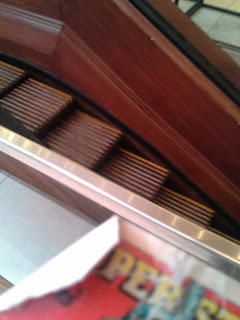 One of those is the last set of wooden escalators in New York City. The escalators date back to the expansion of the store in the 1920s. 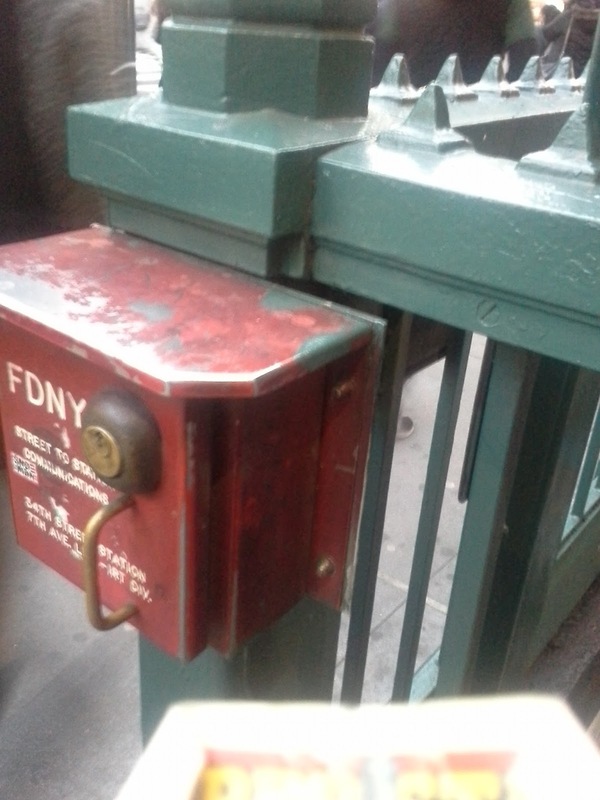 These have miraculously survived the many modernizations to the store over the years and are a favorite of "handrailfans" around the world. 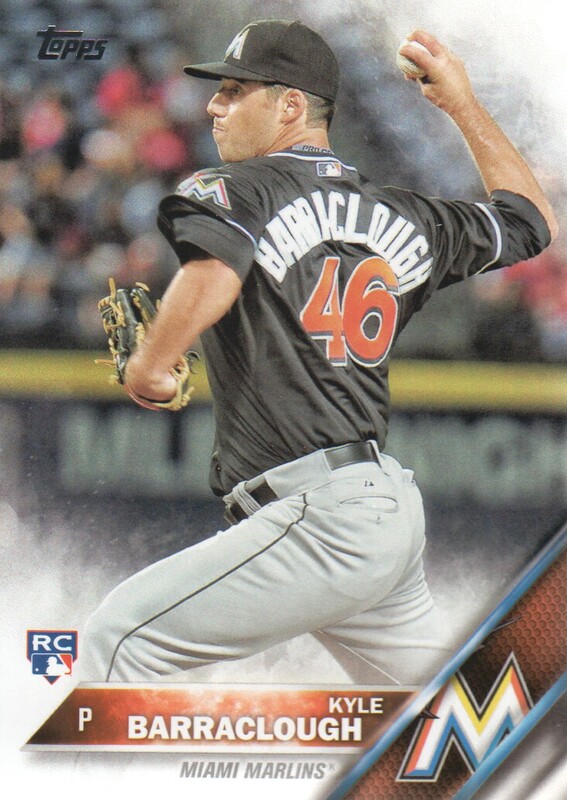 I have one card of Kyle Barraclough, from 2016 Topps. Playing career: Kyle Barraclough came up with the Marlins in 2015, going 2-1 with a 2.59 ERA in 25 appearances. Where he is now: He had a very impressive 2016 season, going 6-3 with a 2.85 ERA in 75 games, striking out 113 batters in 72.2 innings. Google Autocomplete results: He is fourth when you type Kyle Ba, between Kyle Barker, a TV show character, and Kyle Bass China, referring to a hedge fund manager who specializes in that country. There do not appear to be any other prominent Kyle Barracloughs. Coming up next: The next profile will be Jeff Barton. The old New York subway line abbreviations - IRT, BMT, IND - haven't been officially used since 1967. Fifty years later you can still occasionally find references to the old lines. Note the reference to the IRT division on this fire department call box at the 34th Street station. I have two cards of Tucker Barnhart. This one is from 2014 Topps Update. 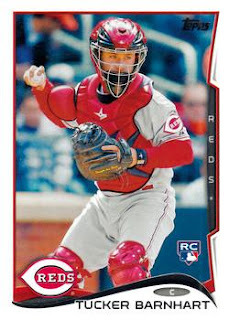 Playing career: Tucker Barnhart came up with the Reds in 2014 and emerged as their backup catcher in 2015, hitting .252 with 3 HR and 18 RBI in 81 games. Where he is now:In 2016 he was the Reds' #1 catcher, hitting .257 with 7 HR and 51 RBI in 115 games. Google Autocomplete results: He is seventh when you type Tucker B, between Tucker Bliss, a creative director, and Tucker Brown, Vice President at Evolution Media Capital. There do not appear to be any other prominent Tucker Barnharts. Coming up next: The next profile will by Kyle Barraclough. I have one card of Luis Avilan, from 2016 Topps. 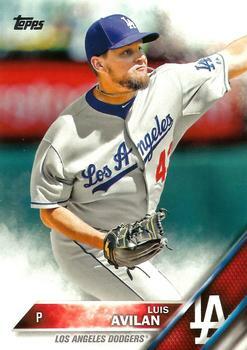 Playing career: Luis Avilan has pitched for the Braves and Dodgers since 2012. In 268 games, all in relief, he is 15-6 with a 2.98 ERA. Where he is now: He will again be a part of the Dodgers bullpen in 2017. Google Autocomplete results: He is first when you type Luis Av, ahead of Luis Avalos, an actor. There do not appear to be any other prominent Luis Avilans. Coming up next: The next profile will be Tucker Barnhart. 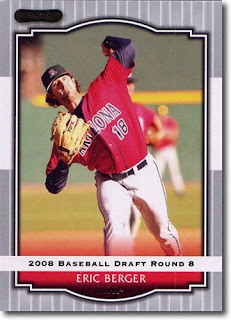 I have one card of Michael Aubrey, from 2008 Bowman Draft Picks and Prospects. 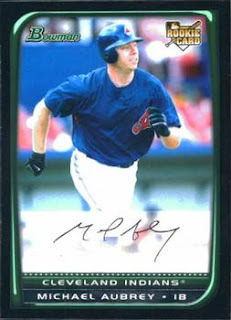 Playing career: First baseman Michael Aubrey played for the Indians in 2008 and the Orioles in 2009. In 46 games he hit .259 with 6 HR and 17 RBI. Where he is now: An accountant in Louisiana. Google Autocomplete results: He is second when you type Michael Aub, between Michael Aubert and Michael Aubert Death, both of which refer to a Florida man who recently passed. Another prominent Michael Aubrey is a Retail Lending Manager at Valley National Bank. Coming up next: The next profile will be Luis Avilan. I have one card of Alec Asher, from 2016 Topps. Playing career: Alec Asher debuted for the Phillies in 2015 and struggled mightily, going 0-6 with a 9.31 ERA in seven starts. While in the minor leagues in 2016 he was suspended for 80 games for use of performance enhancing drugs. The PEDs must have worked because when he returned to the majors in September he went 2-1 with a 2.28 ERA in five starts. Where he is now: Pitching in spring training as he gets ready for the 2017 season. Google Autocomplete results: He is first when you type Alec A, ahead of Alec and Mangus, characters on the television show Shadowhunters. There do not appear to be any other prominent Alec Ashers. Coming up next; The next profile will be Michael Aubrey. First baseman Orlando Merced played thirteen seasons in the major leagues, mostly for the Pirates. In 1,391 games he hit .277 with 103 HR and 585 RBI. Now a minor league hitting coach in the Reds organization, he kindly answered my questions about baseball cards. "I feel a tremendous amount of joy knowing that the fans enjoy and send my cards to Puerto Rico to be signed every week. I don’t collect baseball cards or any other memorabilia." I've done a lot of high-volume baseball card deals in my time, but this one may be the biggest. That's ten boxes you see in this photo - 9 5,000 counts and a 4,000. A little less than 50,000 cards added to my collection in one enormous transaction. What really makes this great is that it is almost all cards from the 2000s - and a lot of it is early 2000s, which means it is overwhelmingly cards that I needed. I bought these cards from a dealer - SMR Collectibles - run by a guy named Steve with a small staff of assistants. 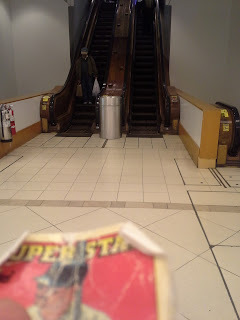 Steve travels around the northeast buying and selling collections. Kind of like American Pickers with sports cards. He is trying to downsize his stock and posted these on Craigslist at a really great price. I got these for $15 each plus a box of non-baseball cards that had no use to me anyway. I picked them up at his storage unit - a huge room filled floor to ceiling with 5,000 count boxes of cards. I would conservatively estimate that I was standing in a room with three million cards in it. These boxes are all commons or semi-stars. It's so much to go through - I'm going to write my impressions of the cards as I go through them - a "live blog" I guess. I'm mostly just listing what is most prevalent in each row, but overall there is a lot of variety in each row. This is really just stream of consciousness as I look over these boxes in some depth for the first time. Once I get this sorted I'll do another trade-a-thon, so keep in mind that a lot of this stuff may end up going for trade. Most of the boxes have a lot of variety. This is the only one that really doesn't. First row: Actually this row does have a big mix. Some 06 Fleer, 02 Upper Deck MVP, a lot of 12 Topps and Panini. Second row: Mostly base cards from 12-15 Topps base and various Paninis. A big run of 04 Leaf Certified Materials. Third row: Very similar to the second. A bunch of 07 Allen and Ginter too. Fifth row: Entirely made up of the smaller 13 Toppses. These aren't inserts but some kind of parallel to the base set. This is the one box that is different than the rest. This is an "All Stars" box that wasn't part of the other group, but that I traded the box of non-baseball cards for. These aren't Hall of Famers, mostly just guys who had long careers and so are fairly well-known. To give you an idea of the caliber, the first player in each row are: Travis Hafner, Jesus Montero, Garrett Atkins, Jeff Conine and Johnny Cueto. Not much different from the commons boxes (and I see plenty of bigger stars in those boxes). He had a few boxes like this and I picked the one with the most modern cards and fewest junk waxers. Unlike the other boxes there are a lot of 1990s and even some 1980s in here. First row: Wide variety. A couple dozen UD Holographics which feed my shiny card appetite. Also well represented are 97 Topps, 13 Topps and 94 Pinnacle. Some 90 and 91 Toys R Us. A lot of Brian Roberts cards from various sets. Second row: A lot of 10 and 14 Topps. Lots more 94 Pinnacle. Some 08 X. Bunch of 08 UD. Some 87 Topps. Lots of 12 Gypsy Queen and Bowman Platinum. Third row: Lots of 97 and 98 Donruss Elite, Pinnacle Certified, Donruss Preferred etc. Small runs of 03 Donruss, 02 Ultra. Lots of 08 Topps and Bowman Chrome and A&G. More 12 Bowman Platinum - wonderfully shiny. Fourth row: 13 Topps, 10 Bowman, 08 Bowman Chrome, lots more 08 A&G. Fifth row: Lots of 10 and 13 Topps. 02 Leaf Certified. A bunch of little round 03 Fleer Hardballs. Sticking out behind them is a 1998 Flair Showcase JT Snow card that is catching the light beautifully. 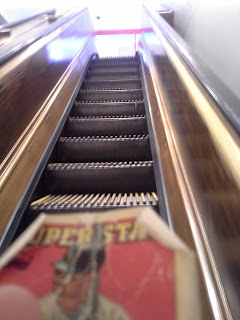 Lots of random cards including small runs of 88 Fleer Exciting Stars and 92 Score. Once again lots of variety, I'm just listing the cards that appear most frequently. Row 1: 08 UD, 10 A&G, 07 Bowman Draft, 06 UD, 10 Topps, 01 Stadium Club. Lots of different Bowmans. Row 2: Lots of Bowmans and A&G. 03 Topps Traded (just rookies). 04 Topps Traded. 10 Tristar. Lots more Bowmans. Row 3: 07 Topps '52 Rookies. More Bowmans. 07 Topps. 07 Finest. 11 Topps Team USA. 04 Topps Traded, both base and chrome. More Bowmans and various Topps base cards. Row 4: 12 Bowman. 10 A&G. 08 Topps. 05 Topps. 07 Donruss Elite. Lots more mid-00s Bowmans. Row 5: 12 Bowman (several dupes of Ted Lilly and Jose Valverde). 05 UD Reflections. Four copies of 97 Bowman Chrome Braden Looper. 06 Bowman Heritage. 05 Topps Total. Lots more Bowmans over several years. 09 OPC. Row 1: A lot of 10 and 13 Topps. Bunch more Bowmans as well. Various years Chrome, Draft, etc. 08 A&G. Row 2: A run of 07 Bowman Draft Chrome. A run of 11 Topps. 06 UD - 8 Ryan Theriots and 7 Val Majewskis. Ever more 08 A&G and various Bowmans. Row 3: Lots of variety followed by runs of 11 Topps and 08 A&G. Somehow there is an 86 Topps Tiffany Jeff Barkley card mixed in here. The back quarter of each row in this box is various Bowman sets from throughout the 00s. Row 4: Big run on 13 Topps, then various makes and models. More 06 UD Bipping - 7 Mike Napolis. Then Bowman in the back. Row 5: Big run on 13 and 14 Topps. Then some variety. Lots of Orioles - look, another Majewski! - anyone know of a good Orioles blogger? Then back to the Bowmans. Row 2: 12-13 Topps; 05 Fleer Tradition; 09 and 10 Heritage; 09 Heritage American Heroes (I'd never heard of this set - really interesting with 9/11 cops and firement, civil rights leaders, scientists, diplomats etc). Row 4: Mostly '16s including Chrome, Optic, Gypsy Queen, A&G. Lots of 12 and 13 Topps too. Row 5: Mostly the '16 sets that are in the other rows, but for some reason there are some Topps and Donruss soccer cards from '15 and '16 as well. This is the 4000 count box. Row 1: Lots of Heritage from various years. Mostly 02, 06, 10 and 11. The back third of the row is all 16 Chrome. Row 2: More assorted Heritage sets. 16 Stadium Club. 16 Diamond Kings. 07 Tristar. Then a lot of 08 Topps. Row 3: More random Heritages. Not much repetition, but in 10 Heritage there are 9 Sizemores and 11 Sandovals. Then a bunch of the snowflake-parallel 16 Topps cards. 2-3 of the same card for many players. 08 Topps and UD. 06 UD. 10, 11 and 14 Topps Pro Debut - again 2-3 of the same card many times. Ditto 14 Update. 4 cards from 14 Heritage - all Kevin Correia. Looks a bit like Diego Luna from Rogue One. Finish the row with some more Tristars. Row 4: 00 Fleer Tradition Update. 16 Diamond Kings and Stadium Club - 2-3 of the same cards. 14 Chrome. 13 A&G. 16 Goodwin Champions. Row 1: Really random little bit of everything. Lots of UD and Bowman from the 03-06 range. 07 Bowman Chrome Chris Carter - 8 cards. 07 Bowman Chrome Jon Jay - 15 cards. 06 Bowman Chrome Yovani Gallardo - 6 cards. Guess someone was prospecting. Some 03 Brooklyn Cyclones. Long Island Ducks magnets - they look like baseball cards. An unopened package of five Long Island Ducks magnets - haven't opened it yet but there are also loose ones of the mascot , Lew Ford (2), coach Buddy Harrelson and the manager Gary Carter. 02 Bowman Chrome John Van Benschoten - 27 cards. Bunch more 02 Bowman Chromes with 5-10 cards each of several players. Row 2: Lots more Bowman. Hey there's another Jon Jay. 02 Topps Traded. 03 Upper Deck Rookies. 05 Topps Update Chrome. Then many more Bowman. The Bowmans are all in the 02-10 range I guess. They're all pretty similar designs. Row 3: Bowman really starts taking over the box at this point, though there's also a run on 03 Donruss Champions. Most of the time the Bowmans are different cards, but sometimes its a few Bippings of the same guys over and over. Row 4: Bowman rules the row, sometimes Bipping but most of the time not. 01 UD squeezes in a decent run to mix it up just a bit. Row 5: Again almost all Bowman with a few 01-03 UDs. Lots of Bippings in this row. Row 1: Lots of 13-15 Topps, 15 Bowman, 00 Topps Traded and 11 Heritage minors. Row 2: Big run of 10 Bowman Chrome Prospects, 15 Topps Archives. 14 and 15 Topps (lots of repetition in the 14s. Row 3: Lots of 16 Topps and A&G. Lots of 15 Bowman. 15 Topps. 04 UD. More Bowmans. 11 Heritage Minors. Row 4: Starts with a big run of 11 A&G, then various Bowman and Topps years. Big run of 09 Donruss Elite, 10 Bowman Chrome Prospects, 04 UD Vintage and 11 Heritage Minors. Row 5: 11 Heritage Minors run. 08 A&G run. Lots more Bowmans. 09 Heritage run. A really random Frank White collection (05 Donruss Champions , 88 Topps Sticker Backs, 94 Ted Williams Going North (5), 94 Ted Williams, 89 Bowman, 86 Fleer Star Stickers ). A few 15 Finests. More Bowmans and Toppses from across the 2000s. Row 1: First third is various short runs of Topps, Bowman and UD products. Then almost the whole rest of the row is 2000 Fleer Focus. Row 2: Really eclectic mixture. Some shiny 01 SP Prospects stand out. A few early 80s Topps commons snuck in. There is a 1988 Topps Tim Leary with his name on a white banner instead of a yellow banner. I guess its just a printing error - I can find nothing about it online, don't know how common this kind of variation is. There is a fairly big run of 06 Turkey Red. Row 3: Another highly eclectic mix, clustered around 2000 and 2001 from all kinds of sets. Lots of vintage-style cards on cardboard, like Bowman Heritage and UD Vintage. Lots and lots of different sets and years in the back. Row 4: Some big runs of 00 Pacific and Fleer Focus, but still lots of variety. I see an MLB showdown card of Brooks Kieschnick pitching. Row 5: First third: Lots of 2000 Topps and random other 2000-2001 cards. Second third: All 2003 Topps Chrome. Last third: Mostly various 2013 Panini sets. I believe this box is 100% Bowman. Row 1: Starts with 04 Draft. Then 04 Draft Chrome with lots of duplication. Then 02 Bowman Chrome draft with lots of duplication. I hope a lot of bloggers need to complete this set. Some 05 Bowmans Best and then back to 04 Draft Chrome. Row 2: Starts with 04 Draft again. Then 03 Draft Chrome with lots of duplication. Then more 02s of course, alternating with more 03s and 04 Drafts, all in Chrome. Row 3: Very similar to the first two rows, with some 01 base as well. Row 4: A little more variety in years but mostly the same as the rest of the box so far. One SP card mixed in all the Bowmans. Row 5: There's a few Topps Chrome and Topps Gold Label but again mostly those 02-04 Bowman and Bowman Chrome. Looks like there will be a lot to trade and fortunately not the same old stuff. Expect another Trade-A-Thon somewhere down the line when I get all this stuff sorted! I have one card of Shawn Armstrong, from 2016 Topps. 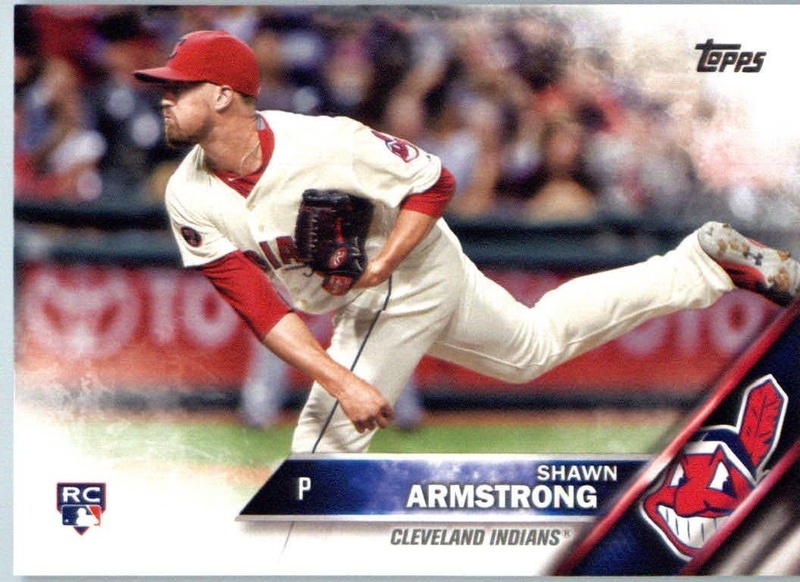 Playing career: Shawn Armstrong debuted for the Indians in 2015, going 0-0 with a 2.25 ERA in eight games. Where he is now: He pitched in ten games for Cleveland in 2016, going 0-0 with a 2.53 ERA. Google Autocomplete results: He is second when you type Shawn Ar, between Shawn Armbrust, Executive Director of the Mid-Atlantic Innocence Project, and Shawn Armenta, a contestant on the TV show “X Factor”. Another prominent Shawn Armstrong is a Fire Chief in Canada. Coming up next: The next profile will be Alec Asher. I am working on a huge purchase with a dealer who is looking to get rid of his post-2000 commons - around 40,000-50,000 or so. It's at a great price and I might pick up some more stuff from him too. In talking to him he mentioned that while he has far more baseball than he needs, he can't keep cards from other sports in stock. Kind of the opposite of the blogs where baseball predominates and there doesn't seem to be much interest in the other sports. I have about 6,000-7,000 cards from the other three sports that I am going to trade to him to offset part of the price. I'm putting the box in my car tomorrow morning - but I would be happy to pull out cards tonight for anyone who wants to trade for any of these before I get rid of them. These three are really good cards that I am not including in this guy's box, but am happy to trade - a Curtis Martin jersey card and rookie cards of Tim Duncan and Kobe Bryant. 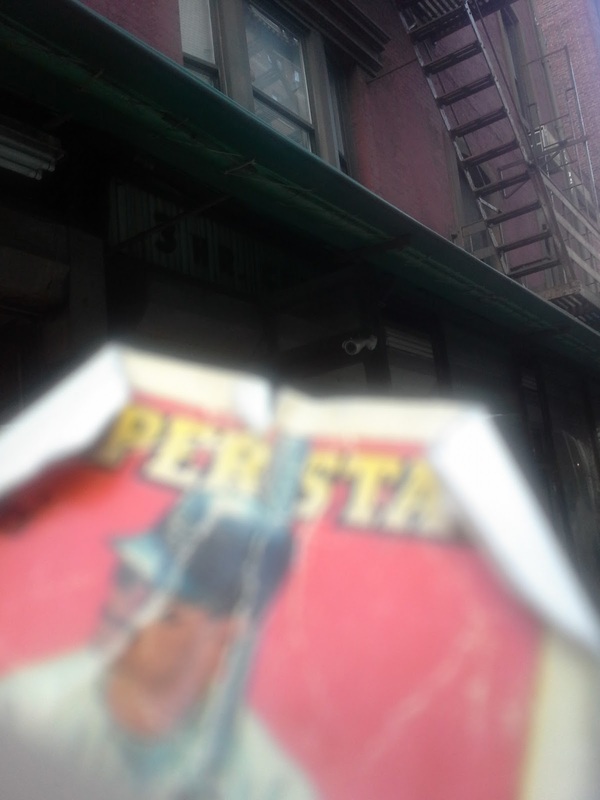 I love finding old signs hidden under awnings. These are hard to see but I like them anyway. C & K Cleaners operated for eleven years (1991-2002) at 258 Lexington Avenue. 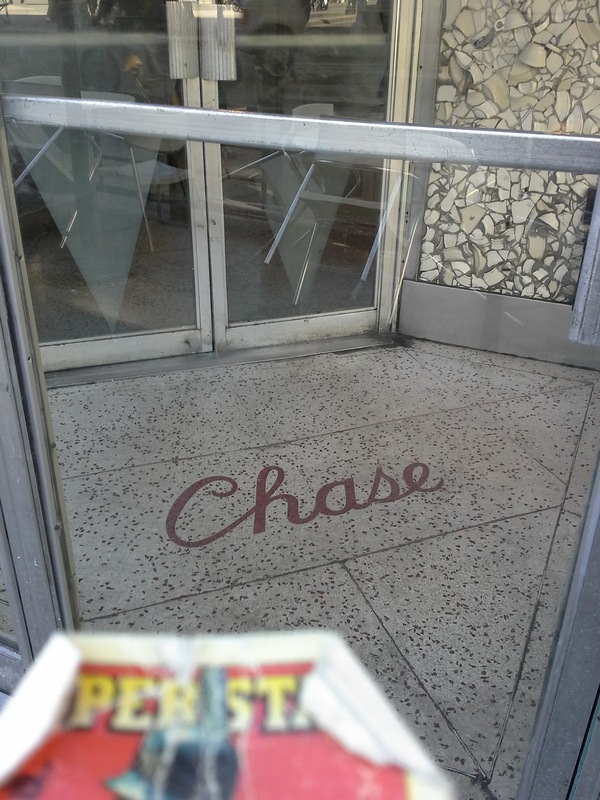 Though the cleaners has been gone for fifteen years, it's signs can still be seen under the awning of what is now a Deli. Note the sign that says "3 HR Cleaners". 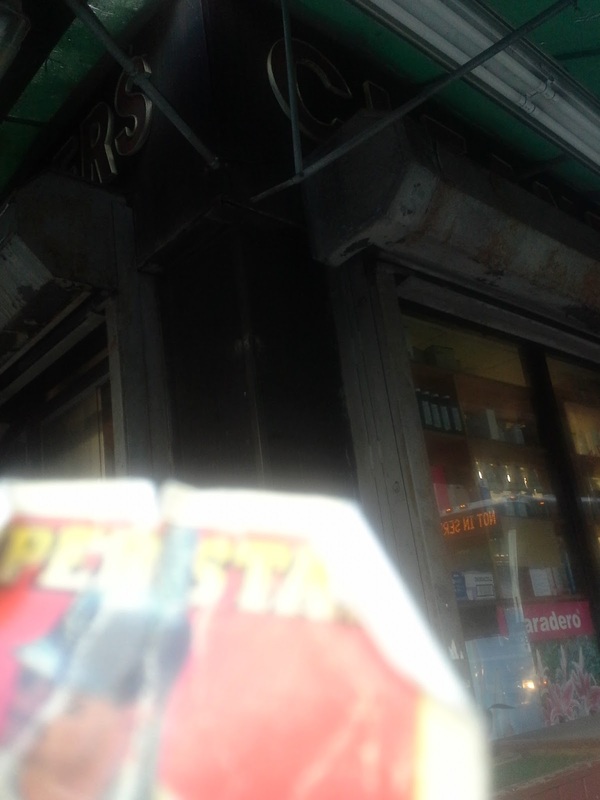 Another "Cleaners" sign partially visible on the side of the deli.